UPDATE: Bayram and Giyas were released on March 17, 2019, by presidential pardon. 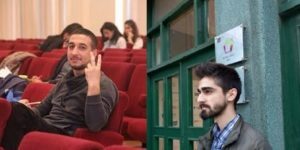 Bayram Mammadov and Giyas Ibrahimov are students and members of NIDA Civic Movement, a pro-democracy youth organization that has been targeted by the government. On May 9, 2017, the two students painted an anti-government message on the statue of Haydar Aliyev, the former President of Azerbaijan and the father of current president Ilham Aliyev. That same day, they posted the photos of the graffiti on social media. The next day, both were kidnapped and taken to the police station where they were brutally tortured. They were asked to publicly beg forgiveness from the statue and to confess to serious drug crimes. After they refused to admit guilt, drugs were planted at their apartments and they were then arrested on fabricated drug charges. In 2016, both Bayram and Giyas received a 10-year sentence for the drug charges. In December 2017, Giyas Ibrahimov and his father were accused of contempt of court. As a result, Giyas’ imprisonment has been extended three more months while his father, Hasan Ibrahimov, has been sentenced to eighteen months of correctional labor with a 20-percent reduction of his salary.Both of them have received death threats during their imprisonment. Baku Police Chief Mirgafar Seyidov, who tortured Bayram and Giyas in a police station, was included in list of candidates for targeted sanctions by United States in the framework of Global Magnitsky Act. Amnesty International also highlighted their cases in its campaign for the release of political prisoners. In June 2017, Bayram went on a hunger strike to protest his imprisonment conditions.